This Polenta recipe is an all-time favorite – because it’s easy! 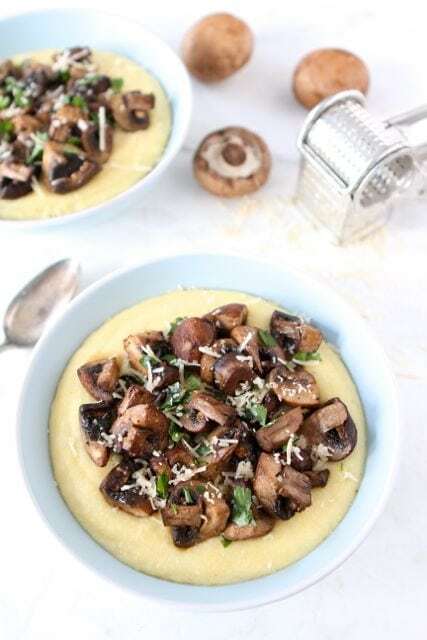 Just whisk away the polenta, toss the mushrooms in olive oil, balsamic vinegar, and a little garlic and let them roast away into this creamy polenta dish! I have a hard time choosing a favorite meal. I have too many favorites and it depends on my mood. 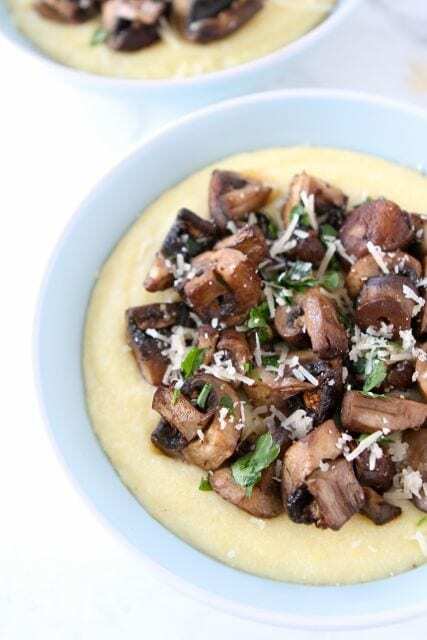 Creamy Polenta with Roasted Mushrooms is probably in my top 10 favorite meals. I am always in the mood for rich and creamy polenta. I could eat an entire pan if no one was watching me. I love the stuff! The creamy polenta is good by itself, but the roasted mushrooms make this polenta recipe extra special. They are the “icing on the cake.” And it’s always a good idea to add more veggies into your diet, right? First of all, what is polenta? Polenta is made from coarsely ground cornmeal and is very popular in Italy. Polenta is similar to grits, but I think polenta is even better than the popular Southern dish. 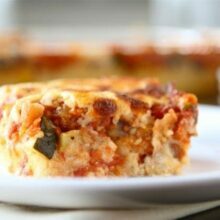 It can be served creamy, fried, baked, chilled and cut into squares. I really love creamy polenta, it is a special treat. This creamy polenta is easy to make, you are going to love it! I start with the mushrooms. I toss the mushrooms in olive oil, balsamic vinegar, and a little garlic and let them roast away in the oven. I cook the polenta on the stove top. You can find polenta or course cornmeal at almost any grocery store. I usually have luck in the bulk bin section. They do sell instant polenta and you can use that for this recipe, just follow the instructions on the box. This polenta is super creamy thanks to the milk, butter, and Parmesan cheese. Oh yes, it is rich and SO worth every bite. To serve, divide the creamy polenta into bowls and top with the roasted mushrooms. Try to savor every bite, but I won’t judge if you frantically shove spoonfuls into your mouth. This polenta recipe is a winner! An all-time favorite for sure! Creamy polenta with roasted mushrooms-an easy and comforting meal. Preheat the oven to 400 degrees F. Place mushrooms in a medium bowl and drizzle with olive oil and balsamic vinegar. Add in garlic and toss. Season with salt and pepper. Spread mushrooms evenly onto a large greased baking sheet. Roast for 15-20 minutes or until mushrooms are tender, stirring once. Remove from the oven and stir in parsley. While the mushrooms are roasting, make the polenta. In a medium saucepan, combine milk, water, and salt over medium-high heat and bring to a simmer. When it simmers, slowly pour in the polenta and whisk to combine. Reduce heat to low and partially cover the pan with a lid and cook, whisking vigorously every 5 minutes. Make sure you scrape the sides of the pan. Cook until liquid is absorbed and polenta is creamy, about 30 minutes total. Remove from heat and stir in the butter and Parmesan cheese. Divide the polenta into four bowls. Top with roasted mushrooms and garnish with Parmesan cheese, if desired. Serve immediately. I’m not a mushroom fan, but your dish looks good!!! Happy Friday to you!! This sounds so amazing Maria! I’ve never made polenta but I need to remedy that! I think I know what we’re having for dinner! My first polenta experience was the Moosewood Cookbook’s polenta pie and I loved it! Do you ever cook with Moosewood recipes? I have actually never had polenta even though it looks beyond delicious every time I see it. And with roasted mushrooms, what could be better?? Maybe this will be the time I finally make it :). I’ve never made polenta before. This looks good! I love reading your posts always! And, this post is no exception. At home today in the Great Smokies with an ice storm – just enough to make it treacherous and I wish that we had some polenta and baby Bella mushrooms!!! My kids are very diffucult to eat, most my girl, but something that they love is polenta, made with milk and so creamy. Great! Another polenta recipe to add to my collection. Thank you! We have been enjoying a polenta/swiss chard soup with a fried egg on top! This would certainly satisfy my mushroom cravings! Maria, it’s like an edible security blanket–so warm and cozy! Mmmm, that sounds yummy! We love polenta here, so I’m definitely going to give this a try. Oh my word. I’m gonna need you to shovel that right into my head, coo? This is perfection. perfect for the crazy cold temperatures we’ve been having! yum! 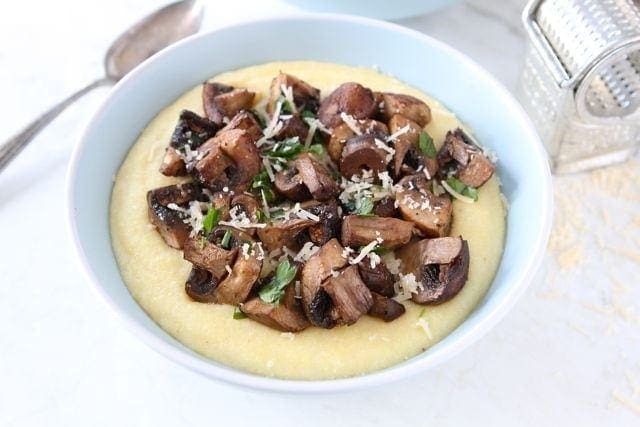 love the flavors of polenta and mushrooms together! This looks incredible, Maria! I’ve been on a roasted mushroom kick this winter, but I haven’t thought to pair them with polenta. Genius. LOVE me some roasted mushrooms!! This looks like one killer dish Maria! You are right! A little arm work out WONT hurt me! lol! this looks just wonderful! Roasted mushrooms are a new phenomenon around our house – I can’t get enough! Healthy comfort food ~ LOVE it Maria. Have a great weekend! So hearty and such good comfort food! this is me! 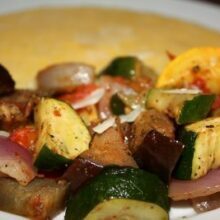 i LOVE polenta, especially with seared fish and some type of salsa or even with roasted veggies. mushrooms, my favorite thing to eat. combine the two, i am in heaven! This is my kind of meal. I am a huge fan of creamy polenta, and roasted mushrooms are just heavenly! 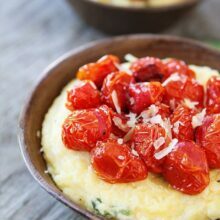 I absolutely love creamy polenta- Polenta is totally underutilized! this dish has covered all the basis of my favorite dishes! love it! Great! On my to-do list for tomorrow’s lunch! Thanks for the recipe! I could bathe in polenta. LOL. I’m trying a new recipe this weekend! SO yummy! Another dish I am going to have to make ASAP! This sounds fabulous! I’ve never cooked with polenta before, but this is definitely a great place to start. Yum! Thank goodness this dish is so simple, I’ll be craving it all the time! Those mushrooms look absolutely perfect on top. thanks for sharing!! This recipe looks fabulous! I am always looking for new ways to make polenta. This photo has me drooling! I am compelled to shop for the ingredients tonight when I get off work(Too bad I can’t go right now!! ), and have this for dinner! Yum – my kids have been requesting polenta for the past week or so… it’s definitely time to try this recipe. This looks so delicious! Comfort food at it’s best, and I know my family won’t miss the meat! Savory, earthy mushrooms and warm, creamy polenta…Could this be any more comforting? I ADORE polenta! My grandma used to make it all the time. She’d either serve it with a tomato sauce, or with sausage and Romano cheese. I *LOVE* the idea of making it with those mushrooms, it looks fabulous. Polenta is becoming one of my favorite go-to meals since you can pair it with almost anything. Haven’t tried mushrooms yet but this looks delicious! That polenta looks seeeeriously creamy. I’ve actually got some at home now, I should probably use it up by making this. Roasted veggies are never a bad idea, especially with balsamic in the mix! I am always in the mood for polenta! Such a great comfort food meal. This looks like a perfect vegetarian dish to warm this cold winter night! Can’t wait to try this soon. Maria, you always manage to make me feel hungry for your dishes! This is right up my alley! So savory. Polenta is my favorite! This one looks like comfort food in a bowl! I never cook with polenta but that needs to change soon. We adore roasted mushrooms. These look wonderful, Maria! I just love creamy polenta! And the mushrooms are the perfect addition! Question, do you buy actually polenta or cornmeal? I have a awful time finding something at out Publix! This may very well be my new favorite dish. I have never made polenta before last night. Sooo good!!!! This looks interesting. I will use rice milk instead as cows milk does a body bad. Will also omit the oil. Don’t need the extra fat. Instead of cheese I will try it with nutritional yeast. Veganizing recipes can be a lot of fun! This looks like a promising recipe. There’s nothing better than creamy polenta and I love the roasted mushrooms! I’ve never made polenta, but I love it. This dish reminds me of one of Michael Chiarello’s signature dishes at his restaurant Bottega. I ordered it, and it was phenomenal. It was served in a jar and topped with mushrooms and parmesan. I’m going to have to make this to transport myself back to Bottega. I’m not afraid of a little arm work!. This was wonderful! I admit, I cheated a little by using instant polenta, and dairy free options (almond milk and rice cheese) but it still turned out great! I also used worcestershire sauce instead of balsamic vinegar (I totally thought I had balsamic in my kitchen, but alas, and it was snowing, so I decided to make do). Definitely will be a repeat offender in my house! Thanks for posting it! I am absolutely with in in being able to eat a whole pan of polenta. 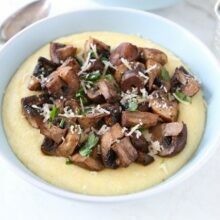 But as a huge lover of mushrooms, grilled or roasted mushrooms and to see them with this wonderful polenta on your pic, I am completely fallen for this recipe…. I love creamy polenta! I like the idea of serving mushrooms with it. Great simple dish. Definitely making it soon! This was FABULOUS. I made it last weekend and it was just perfect. Thank you!! Love your blog. My husband and I have made this three times so far. We absolutely love it! This has definitely become a staple in our house. I roasted some diced leftover pork loin and zucchini with the mushrooms. Wonderful meal! I made this tonight and it was delicious. So rich and creamy! I even linked your site to my blog. Thanks so much, I’ll definitely be back! This recipe is seriously amazing! I’ve made it for two dinner parties in the past two weeks and it was a hit both times. I roasted the mushrooms with strips of fresh sage instead of parsley; I also put the polenta into a casserole dish, dumped the mushrooms and sauce over top, and popped it under the broiler for a few minutes – delicious. It reminded me of risotto in terms of texture, and it was super creamy. I’ll be making this again and again! I just made this tonight and it was divine. Everyone loved it. I did have to use more liquid to get the softer consistency I wanted but the flavor was amazing. Thank you! Can someone please tell me the difference in grits and polenta? I googled polenta and it says “Italian Grits”. 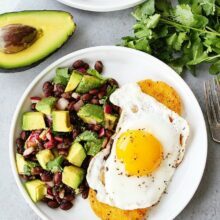 Can I use American regular grits in this recipe. I don’t know the texture of polenta. Texture is my main concern. What a combination this is. Love grits and mushrooms so I’ll wait to hear so I don’t waste ingrediens. I made this tonight and my family really loved it. The mushrooms were so tasty….no need for meat. I like adding milk to the polenta. Thanks for the recipe. I’m looking forward to making this, it sounds delicious. I love mushrooms and I love polenta, so combining them would be a match made in heaven. And I agree with you about making the polenta with milk instead of water. Grits are good made with milk, too. I want to mention that there is an easier way to make polenta. Measure the cornmeal into the saucepan, add the liquid, stir to combine. Bring to a boil over medium-high heat, stirring constantly (important) until it thickens. Getting the cornmeal wet before it gets hot avoids one cause of lumps. Very easy and very very tasty!!! Looks good. Gonna try it.